A Periodic comet named Comet Hartley 2 (103P/Hartley) discovered in 1986 would make close pass by Earth on 20th October, 2010 at 17.7 million kilometers while giving us an opportunity of the best view in decades. The visit comes a few weeks before a NASA probe named EPOXI Mission (Deep Impact Space Craft) is due to fly by (at 700 km on 4th Nov,2010) the icy celestial body to understand origin of comets. Comet Hartley 2 is estimated to come back close to sun at perihelion in April 20, 2017.Whereas it would be close to earth in 24th Sept, 2023. Before we go any Further let us try to understand following questions ? A comet is an icy small Solar System body that, when close enough to the Sun, displays a visible coma (a thin, fuzzy, temporary atmosphere) and sometimes also a tail. These phenomena are both due to the effects of solar radiation and the solar wind upon the nucleus of the comet. Comet nuclei are themselves are loose collections of ice, dust, and small rocky particles, ranging from a few hundred meters to tens of kilometers across. Comets have been observed since ancient times and have historically been considered bad omens. What Happens to Comet when they come close to sun ? The closer the comet gets to the Sun, the brighter it becomes. The Sun's heat vaporizes the comet's ice, and the solar wind blows the vaporized gas and dust into tails than can be more than 100 km in length. Comets have 2 tails - one gas, one dust. The gas tail is straight and points directly away from the Sun, while the dust tail can be curved. The gas tail is usually longer. Comets lose up to 1 % of their ice on each trip around the Sun. If the Earth's orbit passes through this comet debris, a meteor shower takes place. 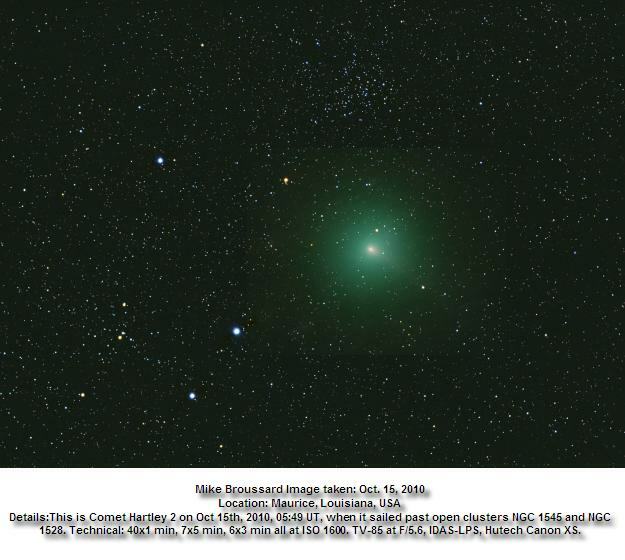 It is always an exciting surprise when a new bright comet is discovered. What are Periodic/Non Periodic Comets ? Periodic comets are comets having orbital periods of less than 200 years (also known as "short-period comets") or which have been observed during more than a single perihelion passage). Non-periodic comets are that who have an orbital period of 200 years or more, including single-apparition comets that pass through the Inner Solar System only once. They are usually on near-parabolic orbits that will not return to the vicinity of the Sun for thousands of years – if ever. 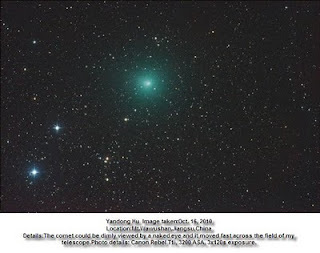 The term non-periodic comet to often referred to comets that will never return to the vicinity of the Sun Note that "periodic comet" is also sometimes used to mean any comet with a periodic orbit, even if greater than 200 years. What is Comet Hartley 2? Officially designated 103P/Hartley, is a small periodic comet with an orbital period of 6.46 years i.e. returns again and again near our sun and Earth every 6.46 years. It was discovered by Malcolm Hartley in 1986 at the Schmidt Telescope Unit in Siding Spring, Australia. Its diameter is estimated to be 1.2 to 1.6 km. It is approaching Earth for an 11-million-mile close encounter on Oct. 20th. What is the composition of Comet Hartley ? It is a large ball of ice primarily containing water, methane, ammonia or carbon dioxide and rock..
Why the Colour of this comet is Green ? Hartley 2's green color comes from the gases that make up its Jupiter-sized atmosphere. Jets spewing from the comet's nucleus contain cyanogen (CN: a poisonous gas found in many comets) and diatomic carbon (C2). Both substances glow green when illuminated by sunlight in the near-vacuum of space. How to Observe – Early Morning: this comet can be spotted from Pollution free moon less clear skies. Few hours before Sunrise using binocular facing towards north direction if one looks above his head he/she can find this green Colour Comet. Using stars of Auriga/Gemini Constellation : Presently it can be found using the Bright Star Capella in Constellation of Auriga. Whereas towards end of month it can be found in the background of the stars of constellation Gemini. How it would look : it should look like a smudge of light against the dark sky background. It would look like a faint, fuzzy patch of light Or may even exhibit a discernible tail. Towards End of October it can be seen as early as 11:30 p.m. but is best just before dawn. Brightness –Moon a Hindrance – First Week November : On 28th October this comet would be closest it can get to sun (perihelion). Hence as it nears sun it would become brighter and brighter. However with Moon returning evening sky it would outshine and brighten the dark skies. That means one may have to wait till after moonset for a good view of the comet. 5 Magnitude till Nov 1st Week – Changes May Brighten – Growing Distance: Presently Comet Hartley 2 is shining around 5 magnitude and would continue to be so up till End of First week of November. Whereas on 22nd October it would be brightest it may get at 4.43 Mag there after as the comet goes farther from earth it brightness would decrease. However as the comet nears sun it warms up after from its cold, deep space sojourn. The ices in its nucleus will be vaporizing furiously – spitting dust and spouting gaseous jets. Hence changes may occur on the comet leading to increase in brightness. NASA – Deep Impact Spacecraft – EPOXI Mission on 4th Nov, 2010 : NASA’s Deep Impact spacecraft (its current mission is called EPOXI) will fly by this comet on 4th November, 2010 at 700 km approach in order to image this comet’s nucleus and take other measurements. Moon Conjunction With Jupiter on 20th October : further in another celestial spectacle Jupiter which was it its closest approach to earth last month can be spotted towards right side of Moon. Magnitude: Astronomy. The degree of brightness of a celestial body designated on a numerical scale, with the scale rule such that a decrease of one unit represents an increase in apparent brightness by a factor of 2.512. Also called apparent magnitude. Brightest star has magnitude −1.4 and the faintest visible star has magnitude 6. Human Eye: The human eye, without the aid of a telescope, can see stars as faint as 6th or 7th magnitude. Like magnitudes ranging between -1.4 (Sirius, the brightest) and around 6 or 7 (the limit for the "naked eye", without binoculars or a telescope). If some of the planets are out, you might be treated to bright Venus (magnitude -4.4 at its brightest) or red Mars (which can be as brilliant as magnitude -2.8). If the Full Moon is out, you can gaze upon an object with a magnitude of -12.6. Once the Sun rises, don't look directly at it; at magnitude -26.8 you'll damage your eyes if you do! Pluto has a magnitude around 14, so you'll need a pretty big telescope to spot it; it is much, much dimmer than the 6th magnitude stars you can barely make out with your eyes. The world's largest ground-based telescopes can detect stars in the magnitude 25 to 27 range. The Hubble Space Telescope has been able to image stars with magnitudes around 30. Alcor (Arundhati Nakshatra) of Ursa Major/Big Dipper (Saptharishi Mandal): Alcor is of magnitude 3.99. In Indian marriages observing alcor is part of marriage ceremony. In ancient time to test eyesight of the groom was tested using alcor. Whereas Comet Hartley 2 would be around Magnitude 5.